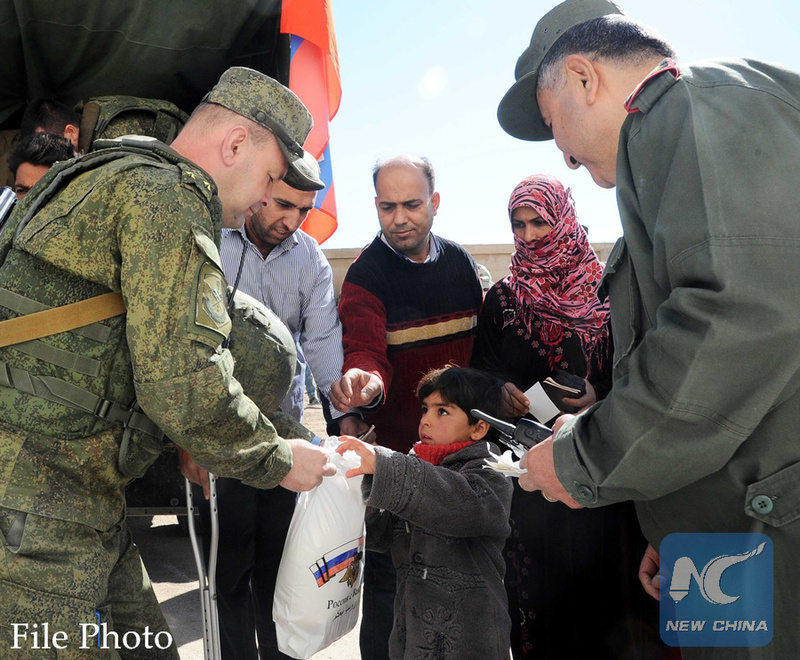 MOSCOW, May 14 (Xinhua) -- Russian servicemen delivered nearly 5 tons of humanitarian aid to more than 1400 Syrian civilians in the past 24 hours, the Russian Defense Ministry said Sunday. "Within last 24 hours, the Russian Center for reconciliation of opposing sides has held 10 humanitarian actions... Total weight of humanitarian aid has reached 4.7 tons. 1,421 people have received humanitarian aid." the ministry said in a statement posted on its website. The total number of humanitarian deliveries has reached 1,210, the document added. Russia has been providing Syrian residents with medical help and regular humanitarian aid amid the continuous chaos in the war-torn country. According to the statement, Russia and Turkey, as guarantors of the nationwide Syrian ceasefire regime, respectively registered 4 and 2 cases of ceasefire violations in the past 24 hours. Nevertheless, the situation in the de-escalation zones is assessed as "stable", the document said. On May 4, Russia, Iran and Turkey signed a memorandum on the creation of four safe zones (de-escalation zones) in Syria, which are guaranteed to be free of battles and airstrikes for six months. The agreement went into force on May 6.